In traditional landscape format with the horizon a third of the way up the image, the Zeppelin bursts dynamically out of the frame from the bottom left edge to near the top right. The airship dominates the photograph as much as it dwarfs the figures clustered below it. Though inscribed Zeppelin III at Lunėville this must be the H class Zeppelin IV, or LZ 16, which we know landed at Lunėville in Lorraine on 3 April 1913. This Zeppelin was powered by three 160cv engines and stretched some 148 metres in length. With a maximum diameter of 14.4 metres, it enclosed a volume of some 21,000 cubic metres. This landing could have been construed as a provocative act by the Germans, given French sensitivity over the territories of Alsace and Lorraine. Indeed Lunėville was the seat of the last Duke of Lorraine, before Louis XV annexed the Duchy in 1766, and turned the Duke’s castle into barracks. 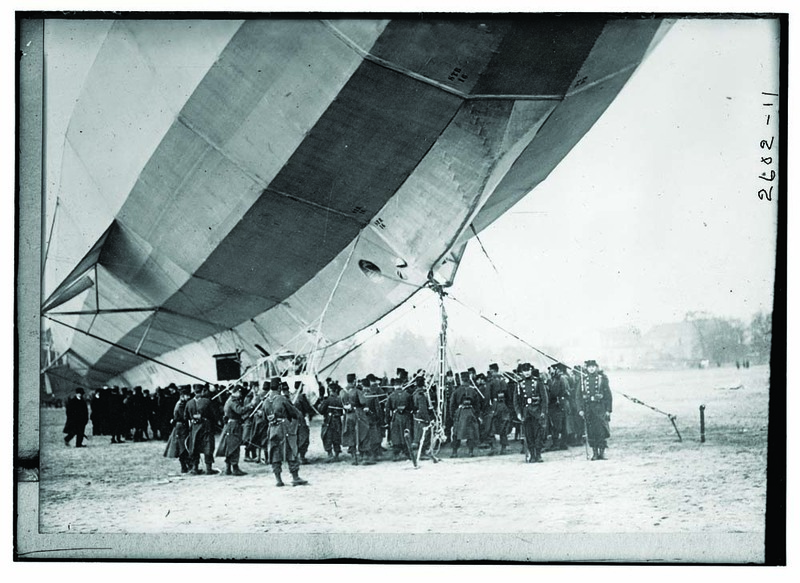 Indeed the Zeppelin landed on the cavalry parade ground of the French Army’s camp at Lunėville. However, the Zeppelin was still undergoing testing at this time, and was carrying civilian engineers as well as military personnel. The crew claimed that poor atmospheric conditions had led to navigational error and the low fuel carrying capacity of the Zeppelin meant they needed to refuel. The landing on French soil does not appear intentional as the French were able to give the airship a thorough going over. General Hirschauer, head of French aircraft inspection, rushed to the scene to oversee the examination of the Zeppelin. German technical advances were thus revealed to the French before the Zeppelin was allowed to leave. It would not be long though before the looming shape of the Zeppelin would threaten the allies in WWI. LZ 16 would undertake reconnaissance duties over East Prussia and take part in the bombing of Warsaw. This article was featured in issue 44 of Military History Monthly.